Switzerland stamps feature a long and unique history that offers invaluable insight into European stamp collectors around the world. The first stamp ever put on sale actually was from Switzerland! It was issued on March 1, 1843. The Zürich 4 and 6 were the first stamps which featured bolded numbers on an intricate background with Zurich inscribed on the top. 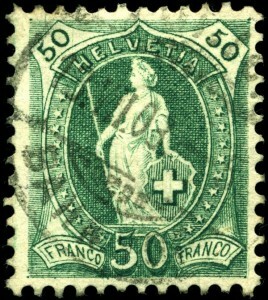 The federal state of Switzerland would not issue stamps until years after the states of Zürich, Geneva, and Basel already were actively using stamps. Each region had its own set of stamps with beautiful designs including the famous “Basel Dove” and “Double Geneva”; these are definitely stamps that European Stamp collectors crave to add to their collection! It wasn’t until 1848 when the Constitution of Switzerland was adopted that it became practical to issue federal stamps to all of the states. The first federal stamp was not issued until a couple of years after that and the exact date of these issues is not certain. Often the federal issues adopted multiple languages in the federal issues utilizing French and German words to place on the stamp’s design. As of 1852, all previous issues of stamps were declared invalid. A new stamp, the Helvetias, featured an allegorical figure embossed and outlined with colors. 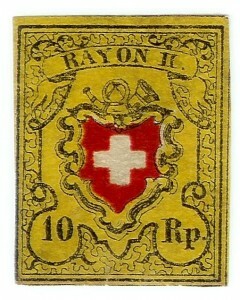 This stamp directly dealt with the multiple languages of Switzerland by placing the words Franco, rappen, centimes and centesimi to enable individuals of multiple languages read the stamp. If you are interested in learning more about Switzerland stamps or any other European/Scandinavian Stamps, feel free to contact Treasure Coast Stamps.